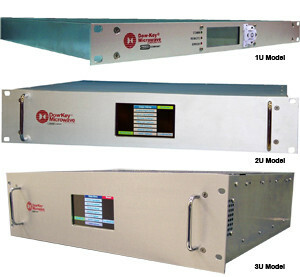 The 4701 Model is a Non-blocking Full Fan-Out (any input connected to any output simultaneously) coaxial switching systemÿoperating from 1 GHz to 18 GHz. The system is configured with maximum (12) N-type inputs and (12) SMA-type outputs.ÿAll ÿinputs are outfitted with high linearity amplifiers in order to compensate for system insertion loss. The 4701-series is equipped with Windows XP operating system (CPU), LCD touch screen display for local control, and redundant power supplies with LED monitoring on the front panel. Remotely, ist is offered with Ethernet and RS-232.